Seriously, how good are Reuben sandwiches? I don’t care that my hubs would disagree, I say Reubens are the best sandwiches ever. I even love anything that is made to taste like them, much like my Reuben Egg Rolls, Reuben Dip, and even these Corned Beef Sliders. Last week, I got a raging craving for a Reuben sandwich but one of the most essential parts of the sandwich, rye bread, does not like me because it’s full of gluten. 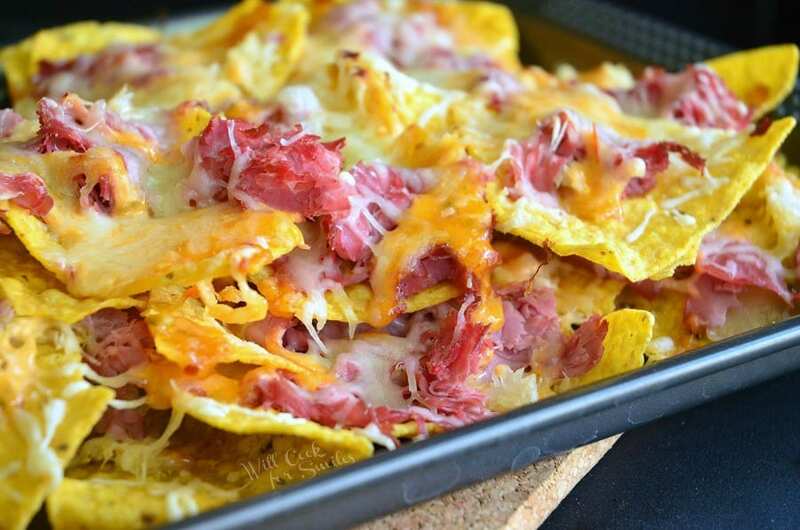 But, it’s alright because I’m scrappy, I can find lots of creative ways to have what I like and it seemed like an awfully fun idea to make nachos! You might think that going out and getting some gluten free bread to make the sandwich would be a more logical thing to do but not in my head. For me, making something new and fun was the more logical route. After all, food would be way too boring if you didn’t get to experiment. 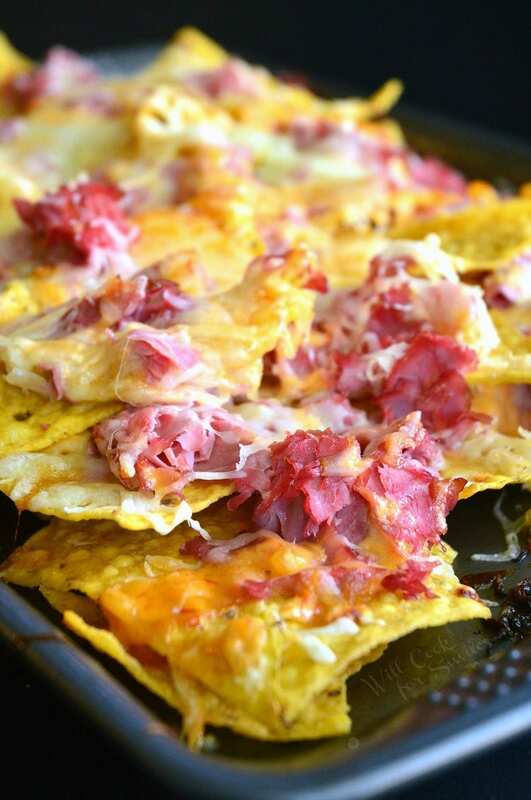 These Reuben Nachos are layered with sauerkraut, corned beef, Swiss cheese, and Thousand Island dressing. Prepare your ingredients: drain and squeeze sauerkraut, shred corned beef, and place thousand island dressing into a sandwich zip-lock bag so it's easy to drizzle. Lightly grease a baking sheet and preheat the oven to 350. 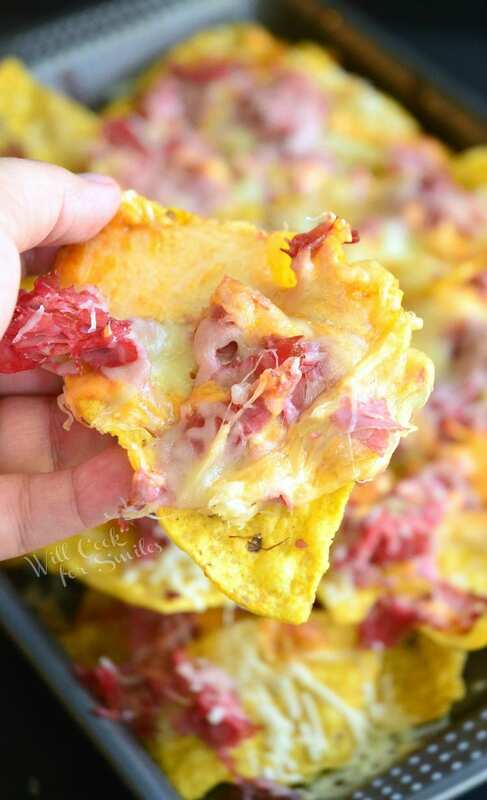 Spread half of the tortilla chips in one even layer. 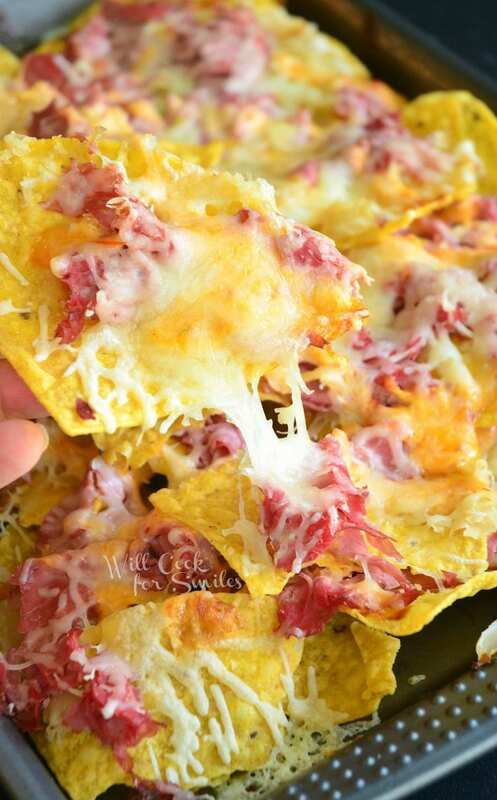 Spread half of the sauerkraut evenly over the chips and then, spread half of the corned beef and cheese over the top. Drizzle part of dressing on top. Spread remaining chips to create the second layer. 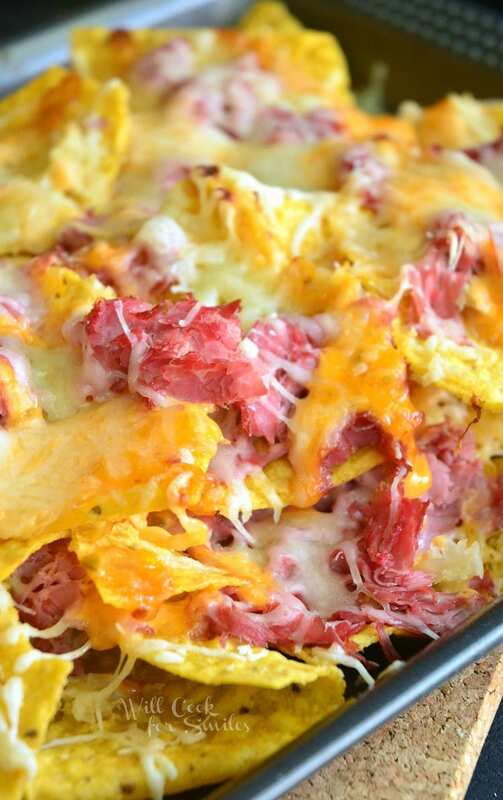 Repeat the layers of sauerkraut, corned beef, and cheese on top. Drizzle remaining dressing and you can also add some more cheese on top. 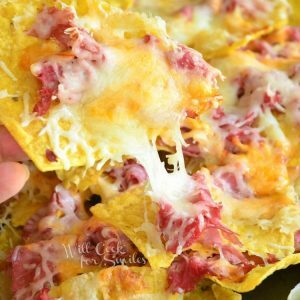 These would make such a great St. Patty’s Day appetizer! Can’t wait to try them! Oh, the sandwiches are absolutely heavenly! I hope you will try them this weekend!